Midland Publishing, Hinckley, 2008. First edition. Maroon hard cover with silver titles on spine. Contents tight and clean with no inscriptions or markings. 528pp. Dust jacket is in excellent condition with cover. This is a heavy book so please check postage with bookseller. From the team that published the critically acclaimed and hugely successful 'Famous Russian Aircraft' series comes a book that is the definitive guide to all of the aircraft flown by the Soviet Air Force in World War II. 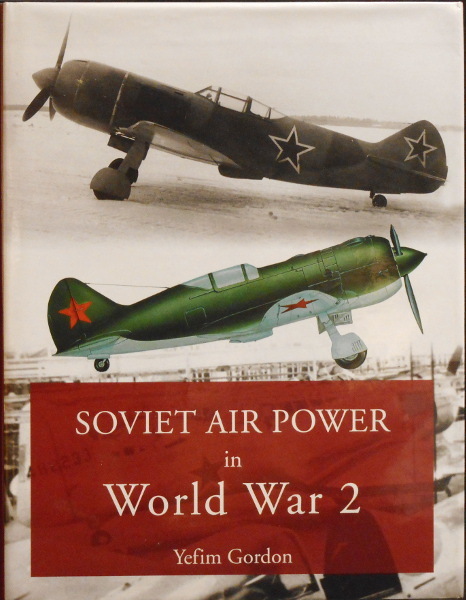 While most other books on the Soviet Air Force in World War II dwell largely on individual aircraft types, this book also takes a closer look at the Soviet Air Force's structure and aircraft fleet. It includes all of the unit insignia of Soviet air armies, divisions and regiments, as well as the varied artwork and camouflage schemes used on individual aircraft. This book features brief descriptions (including performance data) and many previously unpublished photos and color side views of all the aircraft types that operated in the immediate pre-war years and in World War II, including many British aircraft flown by the Soviet Air Force. The most important combat operations conducted by the Air Force and the Soviet Naval Aviation are described and illustrated by tactical maps. The book also tells about the Soviet Air Force commanders and famous Soviet aces of the period; the aces' aircraft and their personal insignia are illustrated. This is a unique book that will be of interest not only to aviation and military history fans but also to modelers.